Last night’s wedding of Daniel and Acacia at Quiet Waters Park in Annapolis, Maryland was beautiful and lots of fun. The rain stopped about 2 hours before the ceremony was to begin which was perfect because it cooled things down a bit and allowed Dan and Acacia to have the beautiful outdoor wedding they had planned. Quiet Waters Park was a great venue to perform at. The courtyard was beautiful and the Blue Heron Room was the perfect size for all the guests. 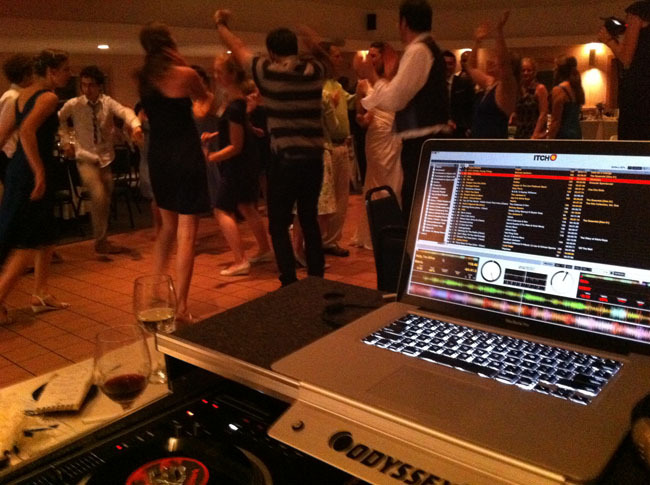 We look forward to DJing more weddings there in the future. Here’s a shot from the DJ booth.